Happy Father's Day to all Dads!! I am laying here on my bed in a hotel room in Lethbridge, Canada, watching the conclusion of the US Open Golf Tournament from Pebble Beach in California. I am missing my wife and kids back in Colorado here on Fathers Day, but am also enjoying a part of the world I have never spent time before. It is going to be a great week here in Canada as we work on an exciting project with our new Canadian friends. I thought I would write a brief post just to honor all of our readers that are fathers. You are all so important to your children and to the legacy that your children will create for you and for the planet. Just keep on loving your children and respecting the planet. As fathers, we are stewards of our children and we should also look at ourselves as stewards for the planet. We should think of ways that we can “father” little things that are in our lives. For me that means caring for our sustainable agriculture systems. I have talked a little about our aquatic programs, and today I want to shift gears and show some pictures of a few of our “furry” children and where we and our “children” live, work and play at the foot of the Rocky Mountains in what we call Mountain Sky Ranch. Is this pretty or what? 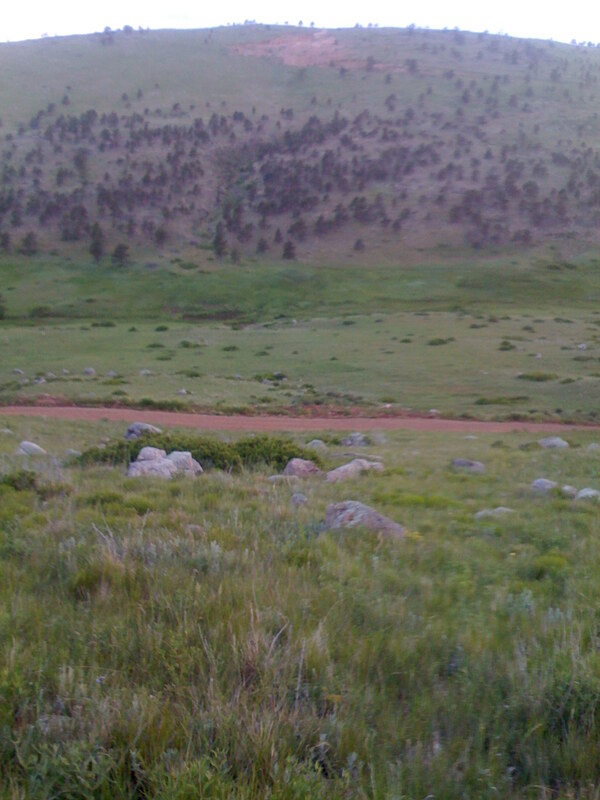 Looking down into the Meadow Hollow Creek valley at Mountain Sky Ranch in early June, 2010. 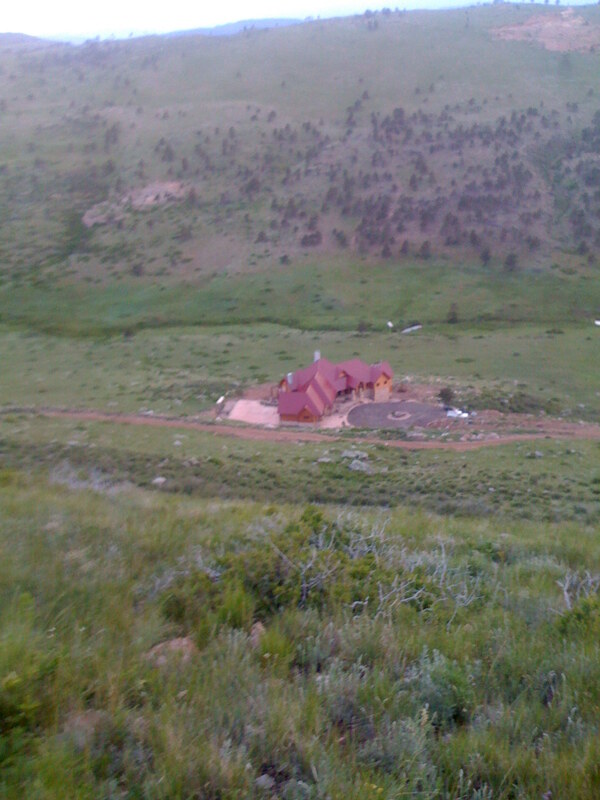 The Lodge at Mountain Sky Ranch. This is our home, a bed and breakfast and an education and events center. 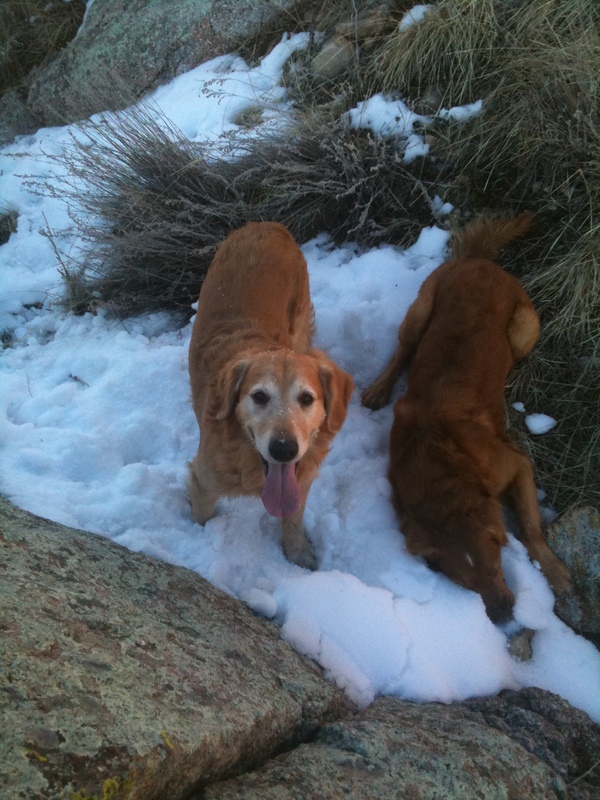 This is Sky and Pete, two of our precious Golden Retriever kids. Sky we bitten by a rattlesnake just two weeks ago here at the Ranch, but fortunately he is tough and he is doing fine. He is also a proud new papa of 8 puppies here from our girl Rascal. Well, here is mama Rascal just a couple of days before having her 8 healthy puppies. She is being a great mom, and the puppies have the love of many in our extended family. 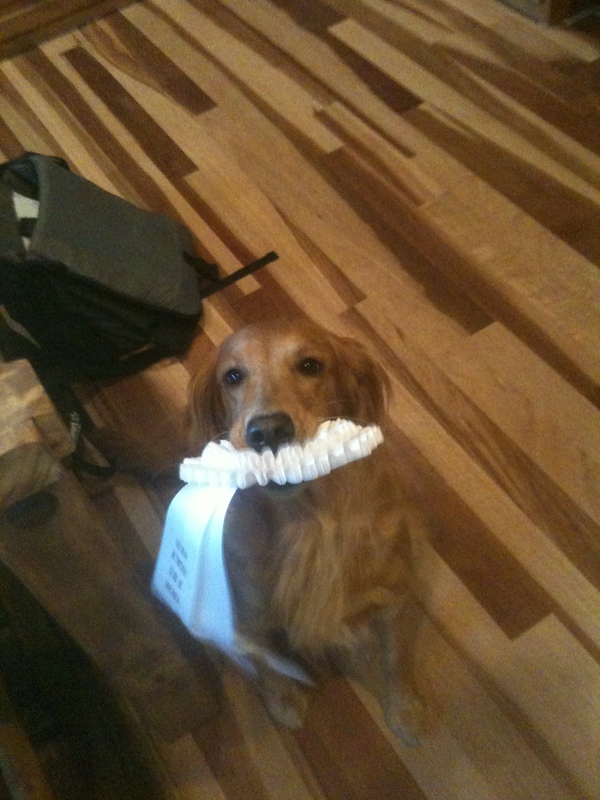 Rascal is holding her 4th place ribbon she won last fall in the Golden Retriever National Championships. She is a proud girl. 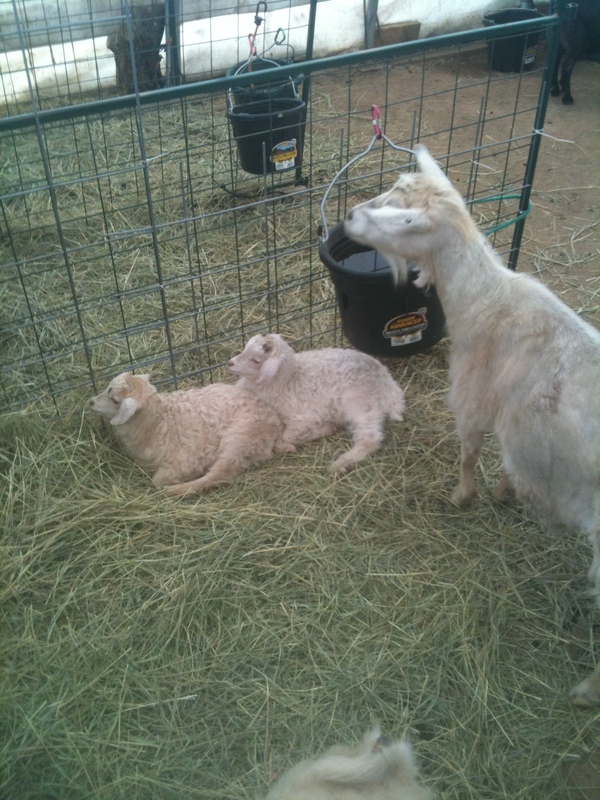 Here are two of our new baby Pygoran goats with their mama, Fluffy. We recently had 5 healthy Pygoran kids that will become fiber and milk producers. 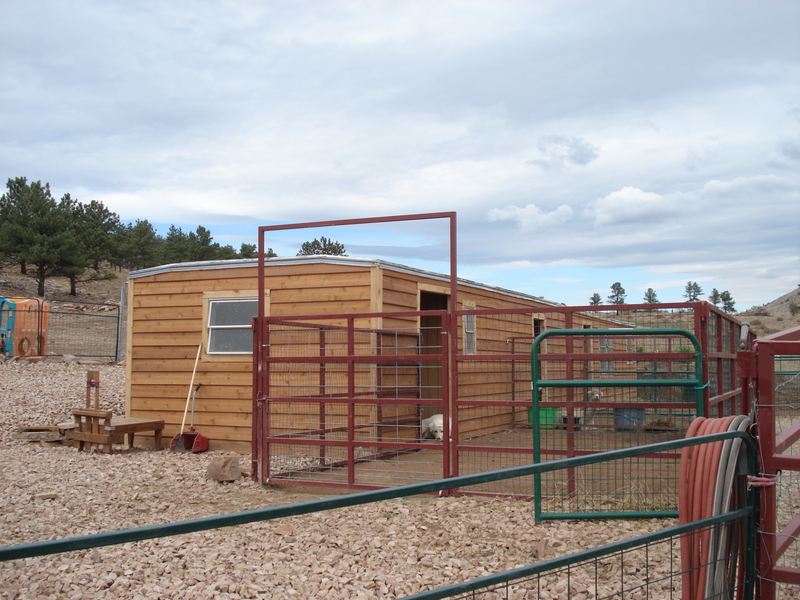 These are championship quality breeding goats that are in our genetic improvement program. Well I thought I would end with this one. 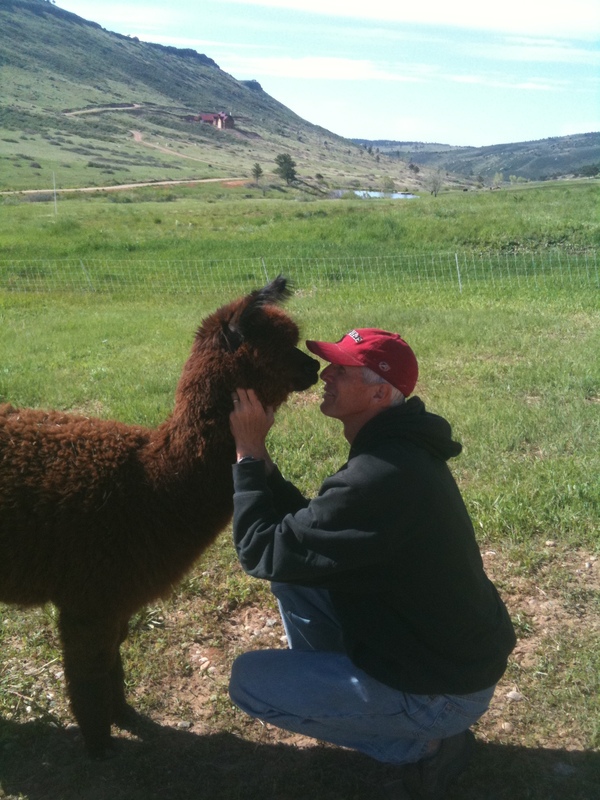 Here I am with Java, one of our sweet alpaca "children". She is what we call our PR animal. She loves people and loves attention. She is also an incredible breeding female who we beleive will greatly enhance our genetic improvement herd. Well again, Happy Fathers Day to all fathers. You are so important to your families and the Planet. Give a bunch of hugs and kisses. 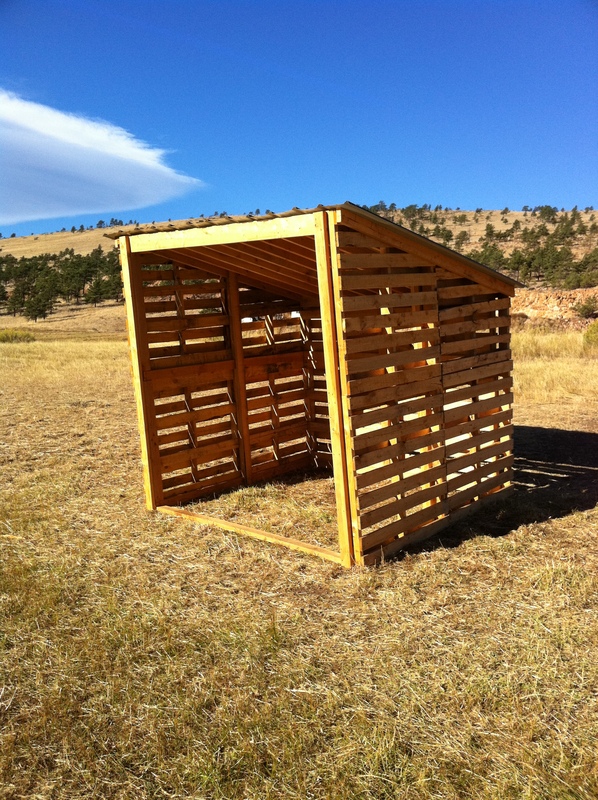 What Do We Think About System Building Materials? Good Morning all. We are having one of our somewhat more frequent wind storms right now here in Northern Colorado. They do not call what we have hurricanes like near the coasts, but when you have sustained winds over 60 miles per hour and gusts over 80 miles per hour I guess we will just call it scary!! I wanted to talk briefly today about IOE’s philosphy about building materials and construction design for ecolonomic solutions. Again, our current focus is mainly on sustainable agriculture construction, so that is where our hands on experience is, but overall our philosphy remains the same for all areas of life and business. 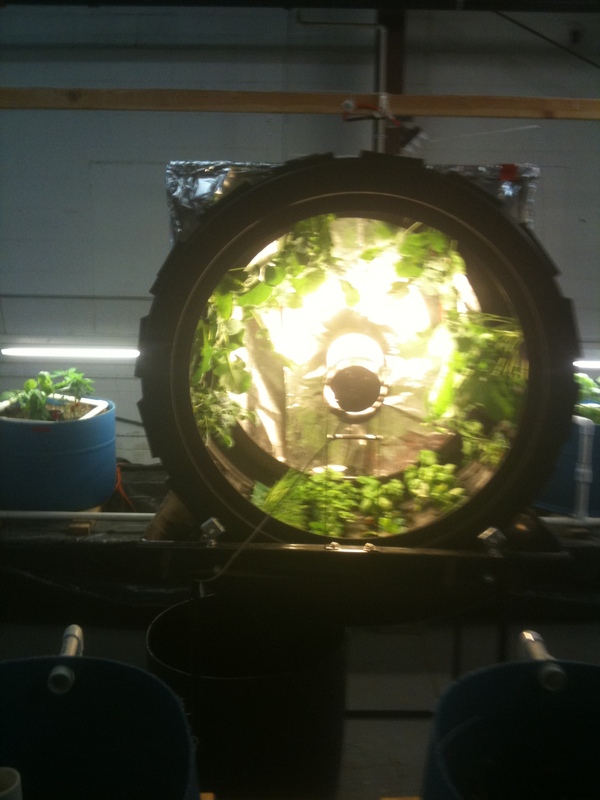 450 gallon biological (bacteriological) treatment tank previously used as a water reservoir for a hydroponic system. several thousand square feet of carpet used for insulation and protection of liner in our raft plant bed. The carpet was obtained free from several local carpet stores that would normally throw it in their dumpsters – landfill bound. Several hundred feet of dimensional lumber (2 bys) used for the bulkheads in the plant bed. This lumber was previously used on abandoned tables used for ornamental plant production (just a little labor to deconstruct). 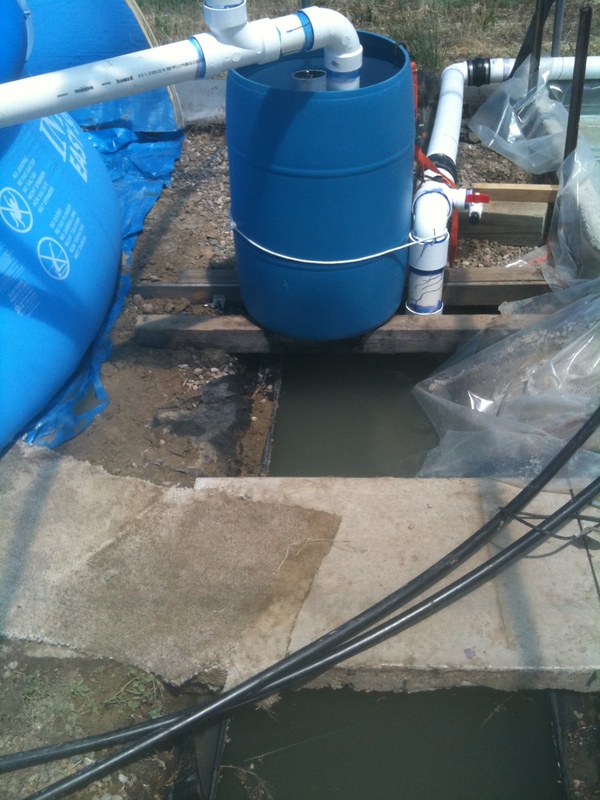 55 gallon plastic barrel used as a sump for the system. We obtain barrels from a number of sources free that again would normally end up in landfills. Miscellaneous piping and valves from previously used systems. 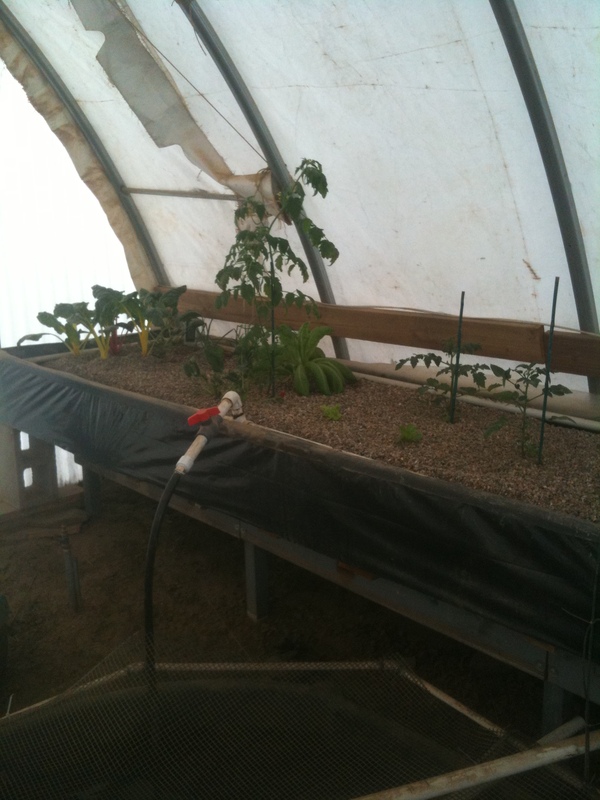 4000 sf greenhouse with a refurbished natural gas space heater. 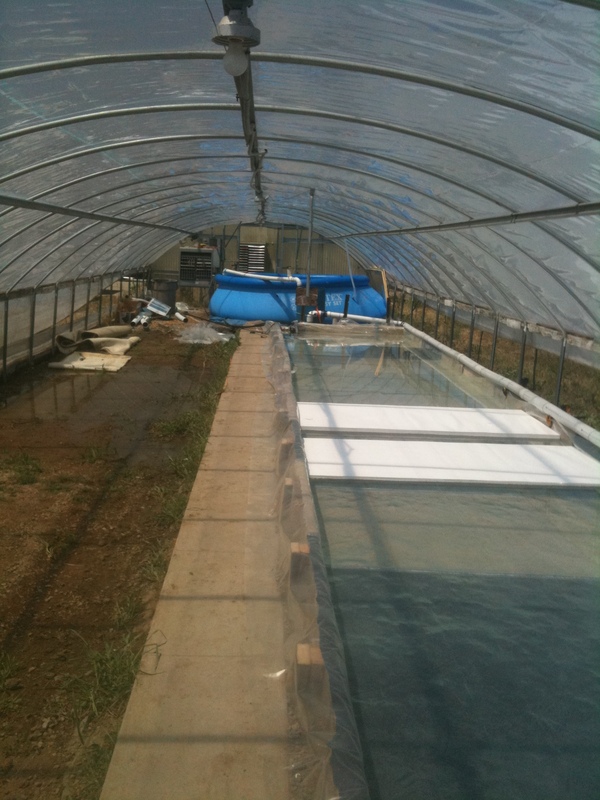 Reused carpet, lumber and tanks for a commercial aquaponics system in our Northern Colorado Greenhouses. 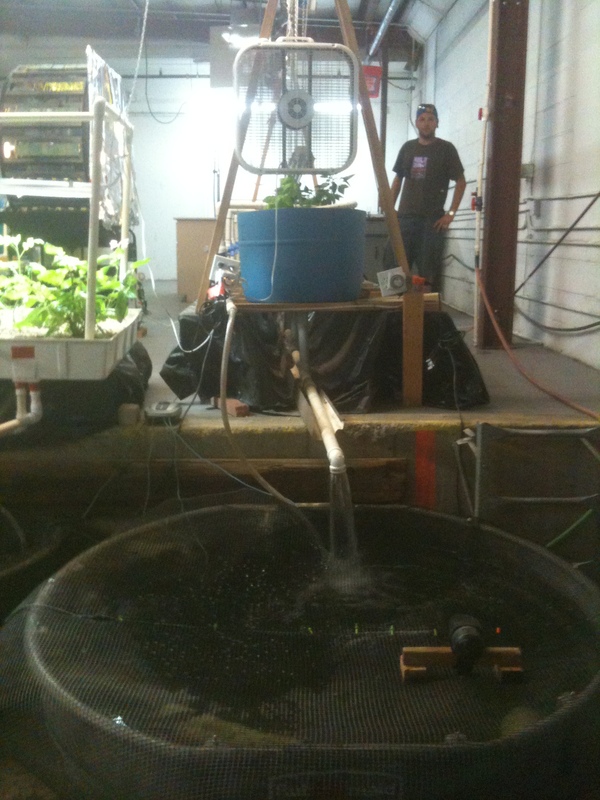 Also ~4000 gallon swiming pool used as our fish tank. 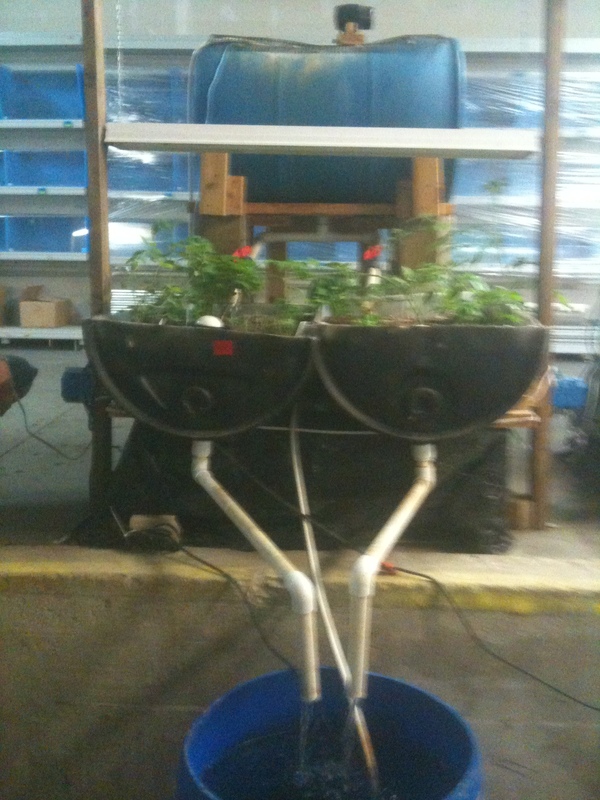 Another view of our ~80'x8' raft plant bed in our new aquaponic system in our Northern Colorado greenhouses. 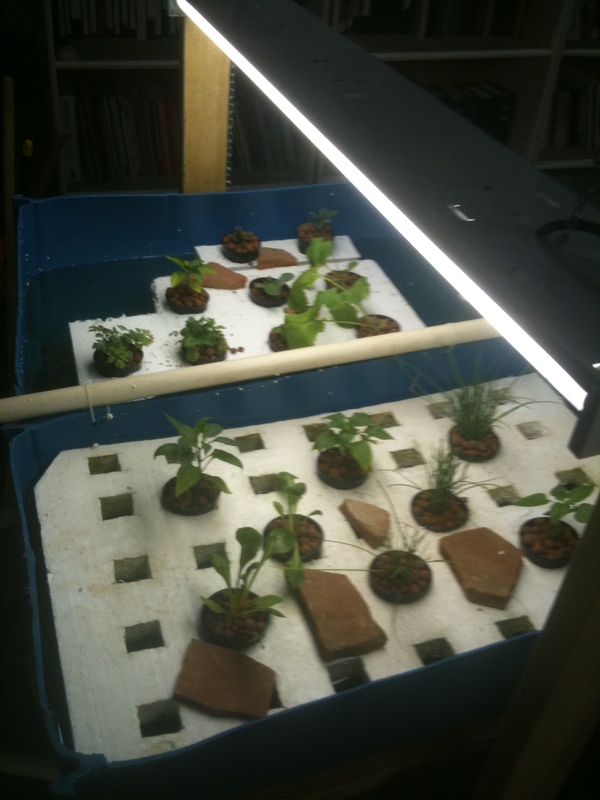 and, finally actual utilization in a full-scale production system. 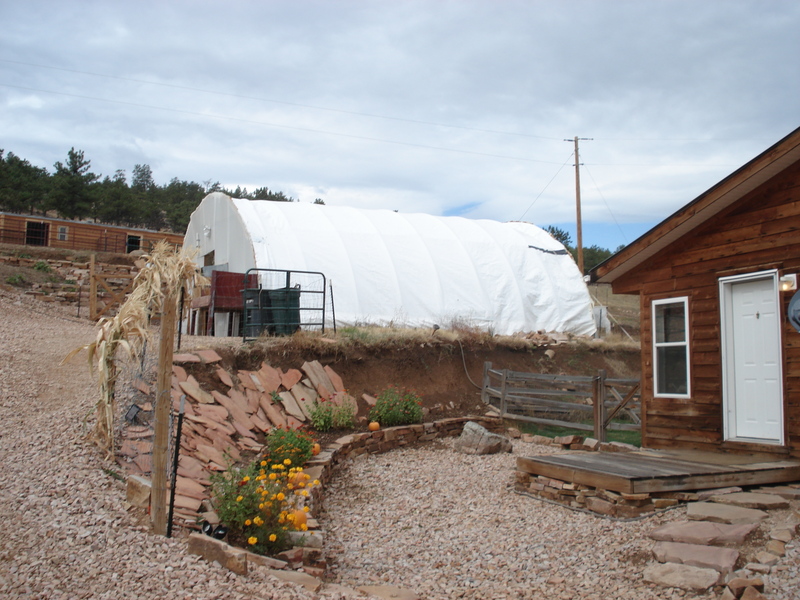 An example, in this system shown here, is the use of 6 mil poly (the same material used as our greenhouse covering) for our plant bed liner rather than much more expensive materials such as EPDM and PVC. 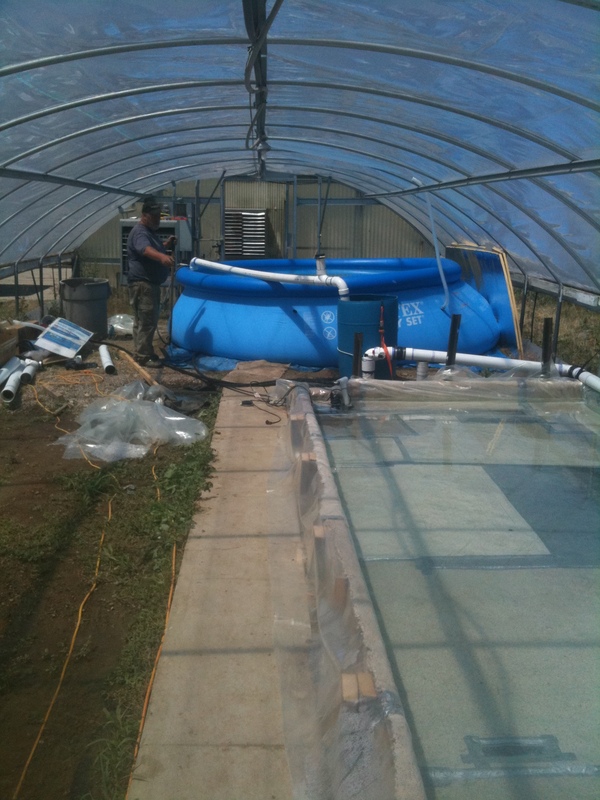 Also, we have used for this system a $200 Walmart purchased portable swiming pool rather than a multi-thousand dollar fiberglass, plastic, metal or more traditional tank construction material. I know, some of you reading this are going to say – “these guys are nuts. This system will never last. Workers will destroy it, and so on and so on.” Well, you may be right, but we do not think so. As we said earlier, we have already tested everything we are using for construction materials on this full-scale system previously in first a laboratory level, then a pilot scale level and for some materials we have ample examples of previous full scale applications. We beleive we are using a proven R&D model and strategy to design systens that are both carbon friendly and economic – wow – Eolonomics. We will be reporting in future posts about the specific costs of this commercial system as well as the results of its operational efficiency and efficacy. We will report on the good and the bad as we see it. 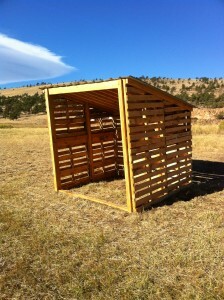 Again, please give us your thoughts and comments. Join us every Tuesday evening at 7:00 PM Mountain Time (6:00 Pacific and 9:00 Eastern) for fun and informative presentations and interviews with speakers from around the world talking about everything Ecolonomic. This webinar format will be combination of audio, video and interactive discussions among speakers, hosts and attendees. You can attend by phone or by using your computer. How cool, get some great information while you lounge at home or while driving down the road!! Our first ECOLONOMICS IN ACTION Webinar will be Tuesday Evening February 23 at 7:00 and will feature the Institute’s CEO and Chairman, Mr. Scott Fardulis, who will be dialoging with our hosts and the audience about the Institute. He will descuss some history (1993 till today), our mission, our current projects and our future. You will not want to miss this. Click on the link that follows to be able to register for the Webinar so that you can attend. https://www1.gotomeeting.com/register/574484520 The registration process is easy and fast. 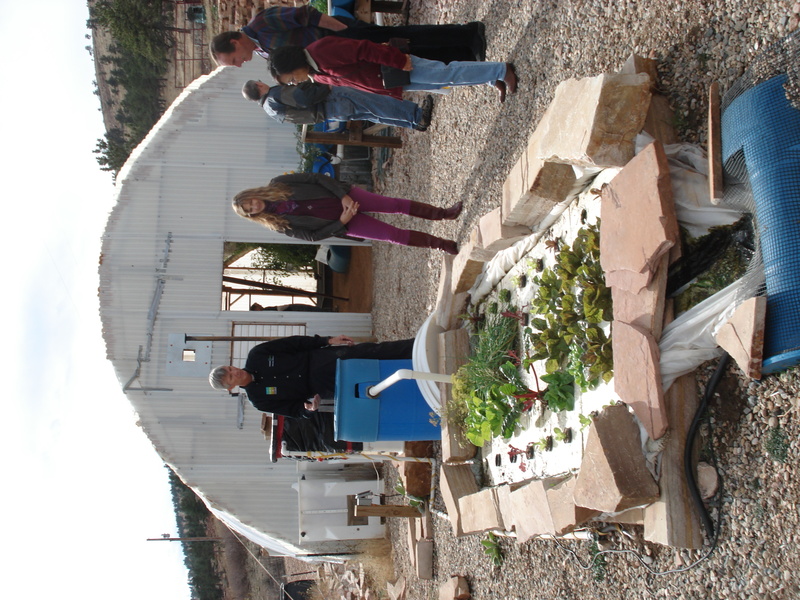 On March 2, our ECOLONOMICS IN ACTION Webinar (at 7:00 PM Mountain Time) will feature Dr. Wayne Dorband, CEO of Mountain Sky Group, who will talk about Sustainable Agriculture and the Institute of Ecolonomics role in this area. 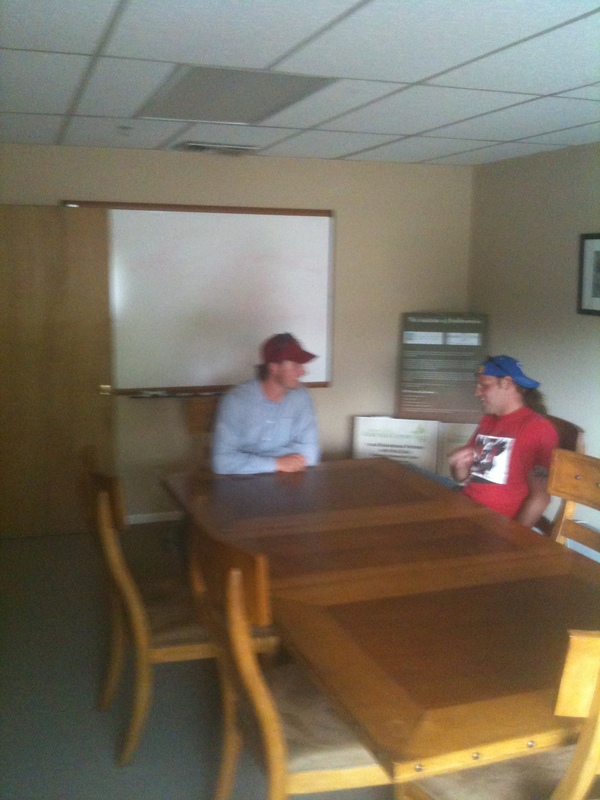 Dr. Dorband has a 35 year history of working in the environmental industry as an entrepenuer and leader. Click on the link that follows to be able to register for the March 2 Webinar so you can attend. https://www1.gotomeeting.com/register/190087337 Tell your friends. These Webinars are FREE!! and they will be great! !